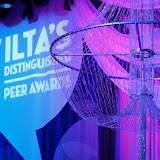 ILTA recently announced the winners of the 2011 ILTA Distinguished Peer Awards Event (we have posted the winners announcement here). ILTA will be releasing the photos from the awards event, but in the meantime, we thought we'd post the photos we took to hold you over. The quality of our photos is not the best in all the shots, but you get the idea... Thanks to ILTA for putting on such a top quality event! On Thursday evening, ILTA hosted it's 2nd annual Distinguished Peer Awards to honor the achievements of those ILTA members and vendors who are making technology work for the legal profession. The Peer Awards, which included 23 categories across individuals, vendors and regions, peers and organizations, was announced at the annual awards dinner as part of ILTA’s 2011 annual educational conference. Joy Heath Rush, Director of Enterprise Multimedia Services at Sidley Austin LLP, has played a pivotal role over the past 15 months in successfully delivering nearly 35 state-of-the-art conference rooms, including five optimized high-definition videoconferencing spaces, a completely self-hosted and self-managed video bridging infrastructure, a fully functional desktop videoconferencing solution, as well as the people and processes to support them. Kara Portwood, Practice Area Solutions Consultant at Armstrong Teasdale LLP, continuously brings value to the firm’s clients by facilitating desktop technology best practices. She often works with clients to help with collaboration, solve technology issues and contribute to building successful business relationships. Bill Caraher, Chief Information Officer at von Briesen & Roper, s.c., realized the vision of his managing partner and created a modular, social intranet like iGoogle. Using the latest in emerging and Open Source technology, Bill and his team created a graphically stunning, user-customizable intranet with easily editable portals. The intranet links to DMS documents, has external RSS content and hosts its own internal “social” platform with a Twitter-like microblog, a Craigslist forum and Facebook\Twitter iGoogle gadgets. Ben Weinberger, currently with Bond Pearce LLP, while serving as Chief Information Officer at Lathrop & Gage LLP, was responsible for migrating the firm to a more robust matter-centric content management system. Consolidating 10 separate databases into a single DB and offering improved collaboration and workflow capabilities, the project achieved 100 % ROI in less than two years. Tanielle Huff, Financial Systems Administrator at K&L Gates LLP, was responsible for upgrading the cost recovery systems while integrating a mix of systems and processes left over from a series of mergers and acquisitions. This project involved the firmwide implementation of a standardized cost recovery platform, including servers, software and databases, as well as all hardware attached to copiers, fax machines and phone switches, and it was successfully completed in five weeks. Scott Rechtschaffen, Chief Knowledge Officer at Littler Mendelson P.C., consistently leverages his keen understanding of law firm business and legal practice to deliver innovative, cost-effective, high-quality knowledge management solutions for internal and client-facing use. Scott founded the firm’s knowledge management department and has developed it to become the largest KM department of any U.S. law firm. He was also one of the first to create client-facing knowledge management systems to help support the needs of clients. Larry Gianneschi, Legal Information and Technology Manager at Colgate-Palmolive Company, was responsible for the successful implementation of a third-party hosted solution combining off-the-shelf and customized platforms from multiple vendors to provide matter management, e-billing, document management, records management and IP management in a totally integrated solution across Colgate's global legal organization. Mike Russell, Strategic Legal Technologist and Director of Business Systems Projects at Liberty Mutual Insurance Company, pioneered the effort to drive financial savings and process efficiency by partnering enterprise legal services with corporate IT to design, develop and implement a technology solution for distributed paper-capture, document management workflow and VoIP communications. This enabled geographically aligned "hub" units of centralized paralegals and staff to support legal tasks for attorneys. During the first four months in operation, this project contributed to a $1.5 million expense run-rate reduction. Julie Brown, Litigation Technology Manager at Vorys, Sater, Seymour and Pease LLP, championed litigation and practice support by re-engineering e-discovery workflows to streamline processes, reduce client costs and ensure that processes are repeatable and defensible. She implemented in-house analytics tools, a workflow-based project management system and creative methods for educating attorneys and paralegals in electronic discovery. Julie is also a public speaker and author on the topic of litigation and practice support, and an active participant in EDRM and ILTA. Kim Craig, Director of Project Management Office at Seyfarth Shaw LLP, was responsible for developing and leading the transformation and innovative implementation of legal project management within her firm. Kim's team of certified project management professionals work on client-facing, revenue-generating matters with attorneys. She has led her team in the convergence of legal project management, process improvement and Lean Six Sigma, knowledge management and practice management with innovative and creative technologies. Gillian Glass, Practice Support and Records Manager at Farella Braun + Martel LLP, implemented a successful records destruction procedure that matches the firm’s retention schedule. The result of this project has saved the firm thousands of dollars in offsite storage costs. She also managed the conversion of the firm's records management system, implementing software that will enable parallel management of the firm’s electronic and paper records. Sean Power, Manager of Enterprise Infrastructure and Security at Lathrop & Gage LLP, achieved a significant upgrade and consolidation of the firm’s network and security infrastructure to develop a highly available computer and network environment with high visibility into performance and operations. This project was completed in an 18-month period. Justin Hectus, Director of Information at Keesal, Young & Logan, is charged with delivering the right information to the right people at the right time to support good business decisions. Over the past year, Justin has led the development of a learning environment that measures end-user skill levels across all applications and job functions and provides personalized training opportunities and credit for participation via a custom-built Web-based system. Meredith Williams, Chief Knowledge Management Officer at Baker, Donelson, Bearman, Caldwell & Berkowitz, PC, is a 34-year-old who is passionate about KM. Meredith started the knowledge management department at her firm over 10 years ago and has grown it into a world-renowned program. Loretta Auer, Chief Information Officer at Fish & Richardson P.C., has championed initiatives to improve firmwide administrative systems and staff productivity through best practices. Loretta has mentored and developed an IT and information management staff that has accomplished projects using the best examples of emerging technologies and development platforms in the legal industry, including .Net-based reporting applications, SharePoint, Windows 7, Office 2010 and e-discovery. Howard Russell, Co-Chief Executive Officer at RBRO Solutions Inc., founded the company to enable law firms to maximize organizational and employee efficiency by utilizing document management solutions. He is committed to providing his clients with the best technology solutions and the highest level of end-to-end services, integrated software products and customized software solutions. Lance Waagner, President and Chief Executive Officer at Intelliteach, Inc., has spent the last 20+ years championing ILTA and providing exemplary user support services. Within the last 12 months, Lance developed the "Guru Guide to User Support" project, including a legal industry-exclusive helpdesk metrics report, a 30+ city ILTA roadshow, a dedicated Guru website with free resources and downloads, several articles for ILTA publications and a presentation (and follow-up webinar) as part of the 2010 ILTA conference. Founded in 1997, Hubbard One is part of Thomson Reuters, the world’s leading source of intelligent information for businesses and professionals. Our innovative set of software and solutions include Web communications, contact and relationship management, experience and pitch management, competitive intelligence and intranets and extranets. Hubbard One’s team of experts also offers a wide range of creative, technology and consulting services. Handshake Software is the leader in providing products and services to enhance SharePoint for intranets, extranets, search, document and email management and mobile access. Some of the world's largest law firms use Handshake products for SharePoint page personalization; out-of-the box integration with applications like Elite/Aderant; to extend SharePoint document management functionality to provide a complete law firm system; to allow non-programmers to quickly create or modify SharePoint Web Parts; and deliver information to mobile devices. Stacie Oste, Training Coordinator at Parker Poe Adams & Bernstein LLP, is the Charlotte, North Carolina City Rep.
South Pacific: Exceeding Your Expectations. Inspired by ILTA members and driven by their commitment, the South Pacific Region sets the highest standard for knowledge-sharing, peer-networking and client service among legal technology professionals. Teamwork and team spirit, camaraderie, generosity, excellence, distinction, achievement, collaboration and creativity reign. Middle Atlantic: Delivering a Large Daily Dose of ILTA. The Middle Atlantic Region’s strong commitment to ILTA’s core values, focus on quality programming and legion of volunteers are hallmarks of the region. They’re proud of their growth, expansion and collaboration with sister organizations, their innovative meeting formats and the large pool of volunteers who contribute their time and knowledge in many different ways, including service as a director or officer, speaking and authoring. Littler Mendelson P.C. has developed Littler CaseSmart™, a case-management solution that combines a Littler-developed proprietary technology platform, rigorous quality assurance measures and an alternative attorney staffing model. This solution streamlines the way that cases are managed and is designed to increase efficiency, productivity and accountability, while providing clients greater confidence that work is being managed with the highest possible quality standards. Bingham McCutchen LLP has designed internal dashboards to promote efficiency and improved communication across the firm. The dashboards' improved delivery of real-time intelligence about clients on a firmwide level; provided lawyers with instant access to their internal financial metrics; and gave both lawyers and staff a comprehensive view of their individual HR information. Bryan Cave LLP has taken a structural approach to innovation that mirrors the research and development functions found in the best global companies. As a result, it has been able to develop innovative solutions on a broad front and bring many more such innovations to market than is typical in large global law firms. ILTA will again be producing the INSIGHT 2011 event in London April 5th. INSIGHT will offer two tracks – The Business of Law 2020 and Law Technology 2020. The sessions offered tie into Law 2020, an ILTA multi-year, multi-platform educational programming initiative focusing on the ways in which law firms will have to adapt in order to thrive over the next decade. You can view the complete agenda online. As always, INSIGHT is free and open to law firm or law department professionals. You can register here or by e-mail to Peggy Wechsler, ILTA’s Program Director. ILTA is excited to anounce some new internal organizational changes that will allow them to better tackle their new initiatives and their constant pursuit to top themselves with each Annual Conference. Peggy Wechsler remains as Program Director but will concentrate more on strategic planning, including focusing on vendor, alliance, and press relationships. TJ Johnson, who has been will ILTA since 2003 has been promoted to Program Manager of Conferences. You may not be familiar with TJ, but she is the lady behind the logistics of the conference, from the educational program to the details. You may have seen her running around the conference with a headset. In her new role, she will take over moreof the planning from Peggy of special events outside of the annual conference, i.e. INSIGHT and ILTA’s track at LegalTech. Another ILTA team member, Deb HImsel, has been promoted to Program Manager of Core Education. Deb will direct the coordination of all the regional meetings, roadshows and webinars (and other new media) in this new role. Gaynor Senyszyn, who previous served as ILTA’s Peer Group Coordinator, is moving over to Conference Coordinator to provide support to TJ and the conference planning committee. A new team member, Kristy Cole, is joining ILTA as Communications Specialist and will be working with Executive Director and Editor, Randi Mayes, on ILTA's publication Peer to Peer and its popular whitepaper series. Kristy has spent the last five years as IS Communication Administrator and Web Content Editor for Mayer Brown so the ILTA content is very familiar to her. ILTA's 2011 Distinguished Peer Awards program, announced earlier this month, recognizes outstanding achievements in organizational and individual excellence involving areas of focus covered by ILTA's peer groups. Vendors and consultants will also be recognized, for superior achievements in thought leadership and innovation. The rather simple nomination and application process encourage ILTA members and vendors to nominate themselves, peers or their organization by the April 30th deadline. In addition to the award itself, presented at the awards dinner at ILTA 2011 in August, winners will be featured on the ILTA website and in various ILTA publications. Editors note: InsideLegal covered the inaugural ILTA Peer Awards last year and we were very impressed with not only the caliber of nominees and winners, but with the overall organization and presentation - check out the coverage from 2010. "It's time to turn the dial to 'reset' and, starting now, do things differently in the business of practicing law! The worst is over and as businesses of every type pick themselves up, dust themselves off and forge surprising new routes for the future. The College of Law Practice Management invites you to attend the 2010 Annual Conference at American University Washington College of Law to hear how other lawyers and law firms are breaking that horrible precedent habit. You'll want to be there as assumption-changing speakers explore and predict ways in which the legal enterprise will "reset" after two years of upheaval. Small group discussion sessions will get up close and personal about what's really happening in law offices around the globe. You'll come away with a list of ways in which your firm can press the reset button and set out in new more profitable directions." If you aren't familiar with The College of Law Practice Management, it is an honorary organization that recognizes distinguished law practice management professionals who have made extraordinary contributions to the field. The list of Fellows is a roster of who’s who in the global law practice management world. In addition, the InnovAction Award winners are being recognized at the event. Below is information on the sessions and speakers. InsideLegal will be onsite covering the event so stay tuned. Register at the conference site and select the option for "ALA, LMA or ILTA member ($495)" to take advantage of InsideLegal's partner rate. For questions on the event, email COLPM Administrator Karen Rosen or contact her at 720-271-7015. For decades, top law firms striving to achieve global preeminence have migrated to New York and London in search of the best corporate work, particularly to build strong capital markets practices. But global capital flows indicate that the sources of capital are rapidly dispersing. Sovereign funds, private equity and emerging financial centers in the BRIC countries, particularly China, are growth strategy game-changers, creating opportunities and challenges in the quest for market leadership. Law firms determined to do things differently will require leaders equipped to turn resistance into teamwork. This session explores where the new leaders will come from and how some firms are grooming them for the task. How equity investments, alternative business structures and outcome-based regulation are rewriting the rules of the law business in England, Australia and soon ... everywhere. Firms and clients commit themselves to pro bono activity, to diversity in the workplace, to community support, sustainability initiatives and more. Why do they do it and what are the outcomes? Social Media: the Ultimate Business Development Tool or a Huge Waste of Time? Social media is hot. Staid law firms are opening their firewalls and venturing into the fray. Is there a legitimate commercial aspect to this? Our experts say “yes” and promise you’ll walk away from this session to implement a social media strategy that will change everything. We are outsourcing legal and support work, modifying fee-setting methods, replacing people and paper with technology and just basically upending the way we do our work. Susan Saltonstall Duncan, RainMaking Oasis, Inc. Knowledge tools, elawyering, unbundling and more…technology lets lawyers work smarter, find and serve new markets and expand access to justice for real people and institutions. Marc Lauritsen, "The Lawyer’s Guide to Working Smarter with Knowledge Tools"
Get rapid fire proven tips from College Fellows on how they have pressed the reset button and what changes they are making to improve the business of practicing law. Aric Press, Editor at American Lawyer Media puts together a “to do list” for the law practice entrepreneur. "Business lawyers have played a key role helping to lead Britain out of recession. They face an equally important task helping to ensure that the recovery does not falter. The British Legal Awards will celebrate the achievements of those law firms, teams and individuals who have performed outstandingly, despite operating in the most challenging business environment for a generation. The awards are divided into individual, team and firm categories and have been carefully chosen to reflect the range of practice areas and skills that lie at the heart of the successful law firm or legal department. The shortlist and winners will be chosen by an independent panel of judges made up of senior in-house lawyers, former managing and senior partners and other senior business figures. The judges meet in person to deliberate and the decisions of the panel are final." Earlier this year, ILTA announced an annual recognition program titled ILTA’s Distinguished Peer Awards. The inaugural ceremony was held the last night of ILTA 2010 at the Aria Resort in Las Vegas on Thursday, August 26th. InsideLegal has posted photos of the event [click here to view]. Please note our photos are not the best quality and ILTA will be releasing professional photos. In the meantime, feel free to enjoy ours! The 'ILTA Awards Dinner - Live from Las Vegas' was the icing on the conference cake, wrapping up four and a half days of educational sessions, dozens of social and networking events, and literally hundreds of vendor exhibit demonstrations and product showcases. Prior to the Peer Awards presentation, dinner guests (including all registered conference attendees and a smaller selection of exhibitors and consultant pass holders) enjoyed an amazing three course meal and the comical banter of Jan McInnis, comedienne and professional speaker. While McInnis played the part of awards emcee, various ILTA board members and conference chairs presented the 19 awards spanning individual peer recognition as well as vendor and organizational awards. Specifically, the inaugural ILTA Distinguished Peer Awards program was created to honor the achievements of ILTA members who are making technology work for the legal profession. The program recognizes those who have delivered great business value and transformational impact through their innovations and implementations or have been champions in specific areas of focus for their organizations. You can read more background about each award on the Awards page. Lin Yang - Miller, Canfield, Paddock & Stone, P.L.C. Maritta Terrell - Lloyd Gosselink Rochelle & Townsend, P.C. InsideLegal would like to congratulate all the award winners and thank ILTA for an incredible event - they always manage to top themselves. Kudos to Randi Mayes, Peggy Wechsler, TJ Johnson, Ken Hansen and the entire conference team - this was our 11th ILTA Conference and it was the best!